Review by AllTheBestFights.com: 2017-09-30, good fight between Buakaw Banchamek and Sergey Kulyaba: it gets three stars. The two time K-1 World MAX champion Buakaw Banchamek (formerly known as Buakaw Por Pramuk) entered this fight with a kickboxing record of 231-23-12 (69 knockouts) and he is ranked as the No.6 super welterweight in the world while his opponent, Sergey Kulyaba, has an official record of 30-10-2 (11 knockouts). Buakaw lost the rematch with Yi Long in 2016 (controversial decision, Buakaw vs Yi Long 2) but then he has won four bouts beating Kong Lingfeng (=Buakaw vs Lingfeng 2) and Azize Hlali in his last two (=Buakaw vs Hlali). 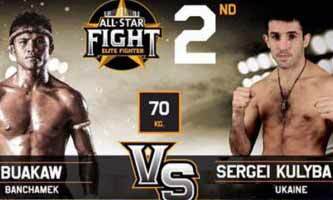 Buakaw Banchamek vs Sergey Kulyaba is the main event of All Star Fight 2. Watch the video and rate this fight!